With this is mind, the statement within the Q&A session that the Club of Rome had predicted the world would soon run out of oil and other resources appeared to be taken as a fact by all those highly educated and very “skeptical” people. Except, of course, it isn’t a fact—it is pure fiction. Luckily, anyone can prove my claim as true or false in a very simple manner (without resort to a discussion on the nature of truth): he or she can read the book (second hand copies of the original are available via Amazon here). I will take you through the relevant pages and passages to prove my point; but I again stress: if you don’t believe me, read the book. The report for the Club of Rome, called The Limits to Growth, was written by a team of researchers at MIT who attempted to model the interaction between earth systems and human systems. The second chapter of the book is entitled “The Limits of Exponential Growth”, and this chapter has seeded one of the most tenacious and insidious urban myths. The core thesis presented is that consumption is growing exponentially, but supply is not. Accordingly, given a finite resource base, demand will bump up against a limit. A finite resource base does not mean a fixed resource base: it just means one that is not infinite. 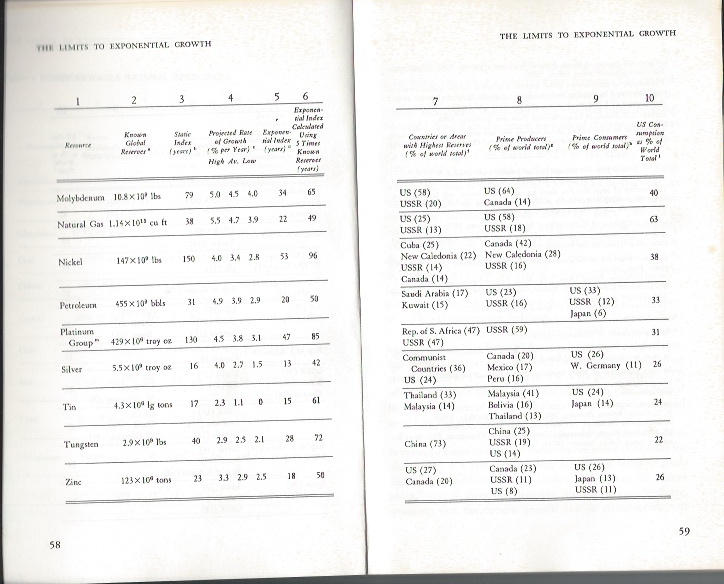 The Limits to Growth team included a “what if” table to illustrate the thesis. 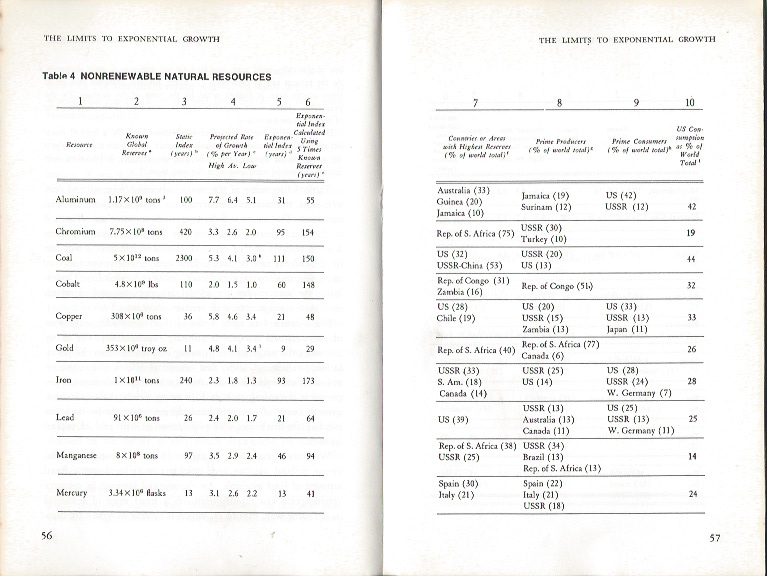 This table (Table 4 in the book), labeled ‘Nonrenewable Natural Resources’, sets out the number of years a select group of resources will last based on various assumptions (click for larger image). The ‘Static Index’ (Column 3) is the number of years a known resource will last at current consumption. The ‘Exponential Index’ (Column 5) is the number of years a known resource will last if consumption grows at the current growth rate. Finally, Column 6 arbitrarily multiplies the known resource base by five times to take account of future discoveries and then calculates how long the resource base will last assuming exponential growth in consumption demand. So using the ‘Static Index’, petroleum will run out after 31 years; under the ‘Exponential Index’ 20 years; and the ‘Five Times Known Resource Exponential Index’ 50 years. Of course the actual nonrenewable resource availability in the next few decades will be determined by factors much more complicated than can be explained by either the simple static reserve index or the exponential reserve index. We have studied this problem with a detailed model that takes into account the many interrelationships among such factors as varying grades of ore, production costs, new mining technology, the elasticity of consumer demand, and substitution of other resources. At first the annual consumption of chromium grows exponentially, and the stock of the resource is rapidly depleted. The price of chromium remains low and constant because new developments in mining technology allow efficient use of lower and lower grades of ore. As demand continues to increase, however, the advance of technology is not fast enough to counteract the rising costs of discovery, extraction, processing and distribution. Price begins to rise, slowly at first and then very rapidly. The higher price causes consumers to use chromium more efficiently whenever possible. After 125 years, about 5% of the original supply is available only at prohibitively high cost, and mining of new supplies has essentially fallen to zero. Critically, a skeptic may be able to find fault empirically (perhaps The Limits to Growth is too pessimistic about the advance of technology), but they cannot criticise them for being unaware of price or substitutability. It is also important to note that the authors are not actually saying chromium will “run out” after 125 years. In their words, the “use of the resource is economically feasible” for 125 years—so after 125 years the resource becomes economically unfeasible to extract even if it still remains in the ground (that is, it hasn’t actually run out). Given present resource consumption rates and the projected increase in these rates, the great majority of the currently important nonrenewable resources will be extremely costly 100 years from now. So now we have a truly testable proposition: the majority of nonrenewable resources will be extremely costly in the year 2072. 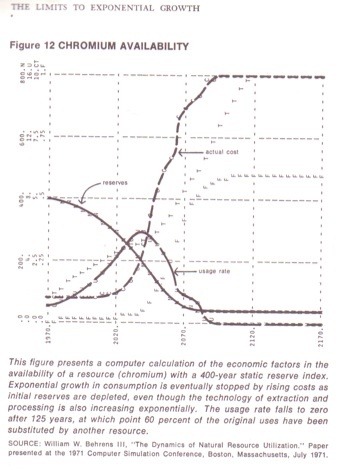 So, according to the Club of Rome, [petroleum] reserves should have been overdrawn by 50 billion barrels by 1990. In fact, by 1990 unexploited reserves amounted to 900 billion barrel — not accounting the tar shales, of which a single deposit in Alberta contains more than 550 billion barrels. The Club of Rome made similarly wrong predictions about natural gas, silver, tin, uranium, aluminium, copper, lead and zinc. The concept of wrong predictions made by The Limits of Growth had become so widespread and entrenched that often it was not even necessary to provide details. What we can say for sure is that the denigration action against The Limits to Growth was extremely successful because it played on some innate characteristics of the human mind; in particular to our tendency of believing what we want to believe and disbelieving what we do not want to believe. It is, in the end, the Cassandra Effect (and, of course, Cassandra was right). The urban myth surrounding The Limits to Growth may be exceptionally hard to kill, but I would hope that any true “skeptic” would never disseminate the myth once becoming acquainted with the actual facts. One lives in hope. This entry was posted in Peak Oil, Resource Constraints and tagged Cafe Scientifque, Chris Rhodes, Skeptics in the Pub, The Club of Rome, The Emissions Gap Report, The Limits to Growth, Ugo Bardi. Bookmark the permalink. Thanks for explaining what the Club of Rome was actually talking about. However I have to gently take issue with your criticism of Cafe Sci types, and skeptics/sceptics, for “nodding of heads and murmur[s] of approval” at a common fallacy (or, as you describe it, “urban myth”). Whilst I can no more speak for skeptics/cafe-sci-types than I can herd cats, it seems to me what distinguishes us from our fellow citizens is not being right about everything but being aware that we are ignorant and sometimes incorrect about things, and seeking (through our Cafe Scis and our SitPs) to become less wrong, and to cease disseminating myths, through acquainting ourselves with actual facts. I trust you acquainted the folks at Cafe Sci with the facts to which you refer and that they – and Prof Rhodes – are now in the happy position of no longer entertaining that particular myth? John. This is certainly not a criticism of Cafe Sci types. My point is that a folk memory can become so ingrained in a society that it becomes a generally accepted truth; accepted by even the most astute. The questioner shot off in a different direction after mentioning the Club of Rome, so I didn’t get an opportunity to interject. I will lend Chris my copy of “Limits to Growth” with the relevant passages highlighted; I am sure the Club of Rome makes a regular appearance in questions during his talks. Ugo. Thanks for these kind words. And I must say I loved your book “The Limits to Growth Revisited”. Was a revelation to me.